David Simcock is an up and coming trainer, working out of racing headquarters, Newmarket. His 10 year strike rate sits at 452/3281 (13.78%), although in the last couple of years it has improved past that figure. Although he is best known for Group 1 winning sprinter Dream Ahead, Simcock can train horses in any grade, and he also doesn’t mind a tilt in the betting ring. In this article we scrutinize Simcock’s performance under a range of different conditions, unearthing any trends that may be of use when assessing the best time to support the Newmarket handlers’ runners. From April-June his juvenile debutants are just 1/47 (2.13%) for a loss of £-24, A/E 0.29. They drastically improve in the months of July-August though; with results of 11/65 (16.92%) for £22.50 LSP, producing an A/E of 2.27. His strike rate for the rest of the year is modest, albeit in line with market expectations. As mentioned, Simcock is not shy to put the money down when he fancies one of his runners. Often, money with unraced 2 year olds can be the most significant, and he rarely leaves it behind. 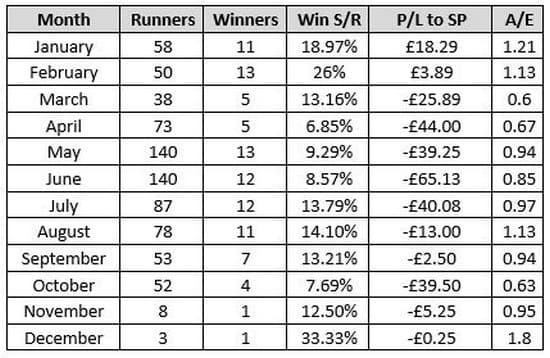 Horses starting at shorter than 3/1 have a great strike rate, healthy profit, and impressive A/E. His runners who see market support on debut should be respected. David Simcock doesn’t have a huge number of first time out 3 year olds, and their performance is far from fantastic; 6/88 (6.82%) for loss of £-53.62 A/E 0.71. 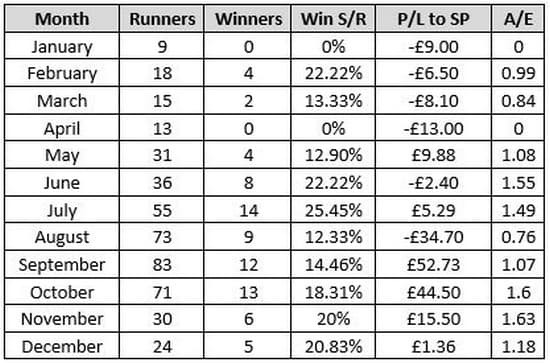 Those who have qualified for handicaps by having 3 runs in maiden company don’t really excel either, and are 5/72 for loss of £-41.25, giving an A/E of 0.69. His horses tend to progress with experience. Once qualified for handicaps, 3 year olds generally have two options; they can either race exclusively against their own age group, or can take on their elders. Back David Simcock 2 year olds in August – they win nearly 3 times as often as the odds suggest they should. His 2 year olds in general have a great record in August. 6f is the trip where his juveniles do best. Those who are strongly fancied in the betting on debut should be respected, and they are profitable. Simcock’s 3 year olds don’t win too often on debut as 3 year olds, and tend to do better with racing. His 3 year old runners in 3 year old only contests do fantastically well in January-February. 3 year old runners in 3 year old+ races do very well in October-December. Simcock’s claiming 5-7lb claiming jockeys do well, and his runners in apprentice/amateur contests also have a very solid record.